**I received a copy of this book in exchange for my honest review, all thoughts are 100% my own. Let's be honest for a minute: How well do you really know your neighbors? I am sad to say that for me personally that answer is honestly- not very well at all! Oh, we have a few who we are friendly with of course. We chat when we're out and about, help each other with yard work, etc.. but for people who we are soooo close to, we're not very close at all. And I'm sure I'm not the only one. On movies and and television, when a new family moves into the neighborhood, they're greeted with a 'welcome to the neighborhood' basket. As a military family, I can tell you we have moved several times over the last few years, and never once have we been welcomed to a neighborhood in such a way. In many of our homes, we never even really met the neighbors at all. "I want to love my neighbor, but I don't know how." Most of us feel guilty about Christ's command to love our neighbor, but let's be honest--we don't even know most of the people living around us. How can we love people we don't even know? Besides, doesn't it count as "loving our neighbor" when we send money to missionaries and put out yard signs for our church? Are we supposed to just knock on our neighbors' doors and tell them about Jesus? 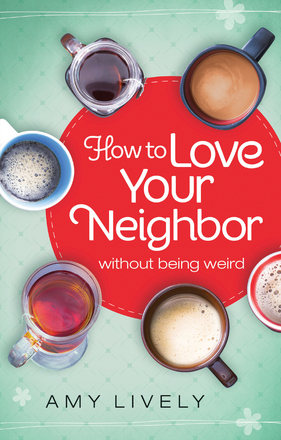 How to Love Your Neighbor Without Being Weird helps you overcome fears about getting to know your neighbors and sharing your faith. You'll learn simple, practical ways to get to know your neighbors, using your God-given personality. As you venture out of the comfort of your living room and into the lives of your neighbors, you'll form authentic friendships, create a safer community, and find fulfillment in obeying Christ's #2 command. Loving your neighbor isn't a random command; it's God's perfect plan. In this book, Amy takes a look at creating lasting relationship and showing God's love in our own communities. I know when I personally hear this commandment, I often find myself taking it far less literally. I thinking 'loving my neighbor' means loving all people... not literally my neighbor. But how wonderful would it be if we DID live in those communities where everyone was greeted with a welcome basket. A neighborhood where we didn't just come home and close our doors to the world, but where we had a loving community to raise our families where we feel safe and most importantly connected. This book is a fun read that offers great tips and insight to allow us to do just that! I will admit, that there were times while reading when I found myself thinking that this sounded great for a social person like Amy seems to be... but me? With my social anxiety? Not going to happen! But don't worry, she covers that too... so don't be afraid to read this book even if you think you could not possibly instigate such a great social change in your neighborhood. This book truly has a lot to offer for all of us. It packed full of Biblical teachings, practical advice for real life and great resources to truly help you take that step to create a better neighborhood where you live! How To Love Your Neighbor is available to purchase now. I'll have to read this- what an interesting topic!